Happy New Year everyone! I hope you all had a fantastic Chrissy and firecracker season, and are ripping and rearing for a great new year! Did anybody make any resolutions? I didn’t, but I’m going to try and do the same thing I do every year; lose a bit of weight. I did pretty well last year, new eating regime helped me shed 10kgs, so I’m hoping to shed a few more. Saying that, a lot of my posts are going to be a bit healthier, or will have healthier alternatives you can use instead if you’d prefer. Now that it’s properly heating up in Melbourne after a fairly cool and damp December, it’s time to break out the icy pole moulds and make some delicious frozen yummies! As I was typing most of this post up, it was 39 degrees Celsius outside!! Ouch!! Definitely a good day for a frozen pop. Nowadays you can get icy pole/popsicle moulds from any where, in any shape and in any price range. We’re no longer limited to just the good ol Lickety Sips! I have 3 sets of these 6 pop icy pole makers from Kmart for just $2 a packet, and I found another smaller maker with room for 8 pops from my tiny local $2+ shop down the road that makes icy poles half the size of the Kmart ones, which are just perfect for Miss G’s little hands and mouth. The Reject Shop normally has good cheap novelty ones too, my local one had rockets and stars last week. 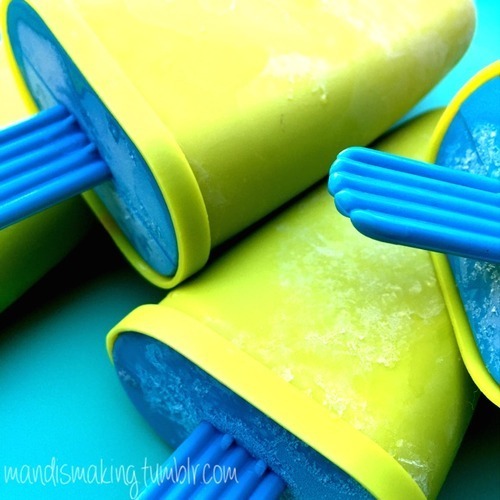 But if you don’t have one, or don’t want to get a pop maker, you can use leftover disposable plastic/paper cups and wooden icy pole sticks from the $2 shop or plastic spoons. I’ve recently inherited a bundle of coloured plastic sticks from the Fandangles ice creams that my parents eat, they’re really pretty and have these cute little stars in them. It’s a great way to recycle them if you’re a fan of the dessert, or if you know one! This is one of the easiest, healthiest pops you’ll make. 4 ingredients (strawberries, coconut cream, maple syrup or honey, and vanilla essence or a vanilla bean), a blender, 10 minutes, and some moulds and sticks. Easy peasy! Just blend, pour and freeze, and after a bout of freezing you’ll have delicious healthy icy popsicles everyone can enjoy. And I mean everyone. This is refined sugar-free, dairy-free, gluten-free, paleo friendly (if you use vanilla beans), vegetarian, and even vegan (if you use maple syrup)! Miss G loves them, they’re a great little healthy treat for her to have after dinner and I know she’s getting only good stuff into her. 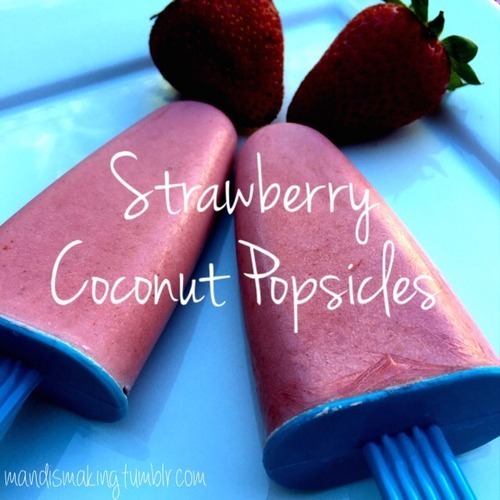 And besides being healthy, these are so cheap to make at the moment! Strawberries are in season, you can pick up a 250g punnet for around $2-$2.50 at most places. Coconut cream is readily available in all supermarkets in the Asian grocery aisle, but here’s a hot tip for you; Aldi. Their coconut cream is by far the thickest I’ve tasted (both light and full fat varieties), and it’s only about $0.85 per 400g can. Bargain! Honey and vanilla are common pantry staples, and maple syrup is getting there too. If you’re trying to find it, it’s hiding with the chocolate toppings and ice cream cones. Make sure it’s the 100% pure stuff though, and it’s about $7-$10 a small glass jug. It’s liquid gold, and worth it. A little goes a long way, and it’s so much nicer and healthier than having white sugar. Can you tell I’m a fan? Now, if you can’t have coconut cream for allergy reasons, feel free to replace it with plain Greek yogurt, unsweetened plain yogurt, or even soy or coconut yogurt. It won’t be considered paleo any more, but it’d be pretty nice! If you use flavoured sweetened yogurt, don’t add the maple syrup/honey or vanilla. And feel free to sub out the honey or maple syrup for coconut nectar, coconut sugar, agave syrup, or stevia if you’d prefer. This is a good recipe for older kids to make by themselves if you trust them with appliances. If your younger ones want to help, there’s always pouring the strawberry milkshake mixture into the moulds and putting the sticks in! Just transfer some of the mix into a smaller measuring jug first, just in case your blender jug is glass like mine! Shake can of coconut cream before opening to mix the water together with the cream. Add all the ingredients to a blender jug and put on the lid. Pulse, then blend on a medium speed until all ingredients are blended together into a pink milkshake. Add more honey or maple syrup if you would like the mixture to be sweeter. Pour the milkshake mixture into the moulds, insert sticks and pop into the freezer. Notes: You can swap out the 400g can of coconut cream for 1.5 cups of yogurt if you are allergic or have a preference. Honey and maple syrup can be changed for coconut nectar, agave syrup, or stevia if you prefer.